If you have a goal, always strive for it and never give up. That’s the advice Susan Koering, sister of GW School of Medicine and Health Sciences (SMHS) Professor Emeritus of Anatomy and Cell Biology Marilyn Koering, Ph.D., gave to first-year anatomy students before presenting the 8th annual Marilyn Koering Award for Excellence in the Anatomical Sciences to Katherine Negreira. Marilyn Koering was a professor and researcher at SMHS for 34 years, from 1969 until her retirement in 2002. “She loved her career and she loved teaching students, she loved her research; that was her life,” Susan Koering said of Marilyn, who passed away in 2008 after a fierce battle against malignant melanoma. The award is given “due to Dr. Koering’s outstanding achievements in teaching, research of the female reproductive system, and as a patient advocate,” Kenna Peusner, Ph.D., professor of anatomy and regenerative biology at SMHS, said during the award ceremony on April 10. Sally Moody, Ph.D., interim chair of the Department of Anatomy, also addressed the students about how important it is to strive for success in the anatomical sciences. “You’re going to be drawing from this information for the rest of your career,” she said. 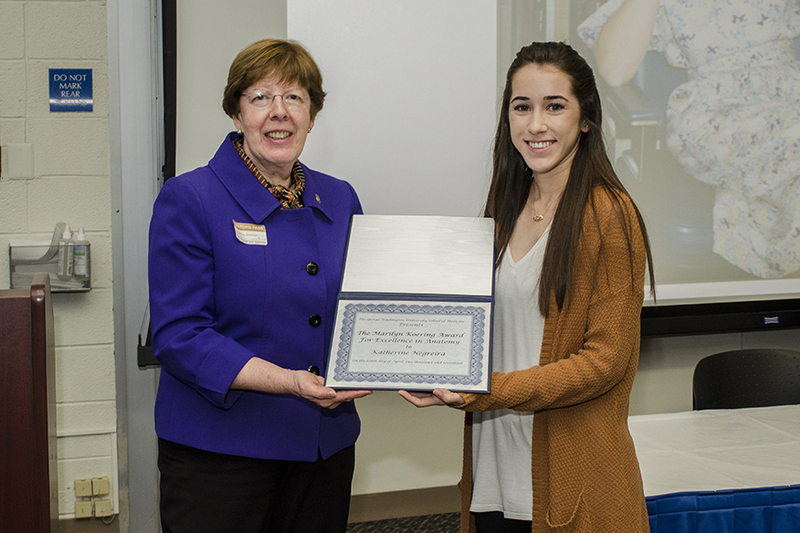 The Marilyn Koering Award is presented to a first-year medical student with the highest overall grade in the anatomical sciences. “I just want to say what an honor it is to get this award. I didn't expect to,” Negreira said after receiving her award from Susan Koering. Marilyn Koering always had her students in mind and was dedicated to their learning needs, said Janette Krum, Ph.D. ’87, associate professor of anatomy and regenerative biology at SMHS. “She was generous with her time with both her students and with her colleagues,” Krum said. She added that Koering, while always taking her academic pursuits seriously, was also “a spirited lady with a great sense of humor.” Krum recalled Koering’s dedication to her beloved Minnesota Vikings, “She’s the only professor I know of to lecture wearing a team sports jersey the day of a big game,” she joked.